Stellar Four: The Secret's Out, Megan Loves "Twisted Miracles"
The Secret's Out, Megan Loves "Twisted Miracles"
I'm absolutely horrible at keeping secrets, so I'm pretty proud of myself for keeping this one for as long as I have. 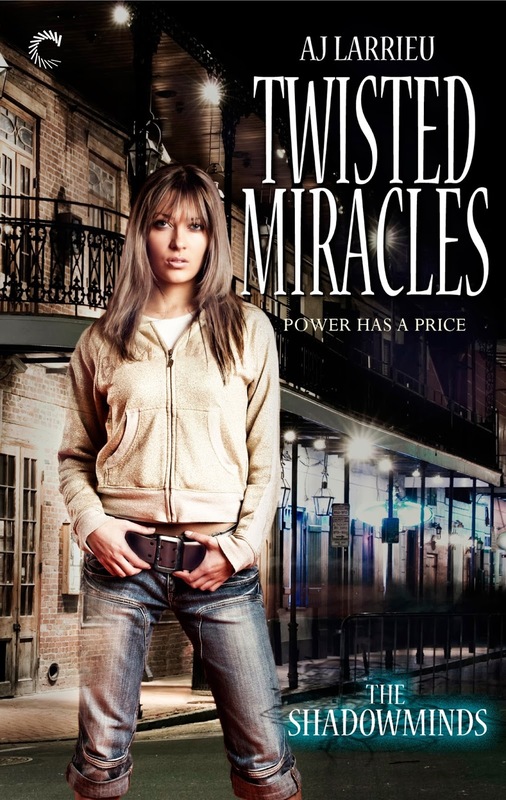 * I purchased AJ Larrieu's new novel, Twisted Miracles, and I loved it. So, what was with all the sneaking around? You see, AJ's a friend of mine. I didn't tell her I purchased her first book because I'm also horrible at faking enthusiasm and it would have made for an awfully awkward conversation if I didn't like it. Yep. It'd look a lot like this and then I'd switch topics. Thankfully, Twisted Miracles rocks and I'm not the only one who thinks so. Two of the biggest names in science fiction and fantasy, authors Chuck Wendig and John Scalzi, have both featured her and her debut novel on their blogs this past week. Pretty friggin' impressive for a new author, right? It's totally deserved. Larrieu's new book is the story of Cass Weatherfield, a Louisiana converter (aka psychic and telekinetic) who has been hiding out in San Francisco for years trying to live a normal, powerless life. That is until her childhood friend goes missing and Cass must return to New Orleans to embrace the life she's denied all these years in order to save her extended family. It's a classic urban fantasy origin story, but one made markedly different by the author's talent for deft descriptions, scene building, and character interactions. Nothing makes me lose interest in a story faster than flowery, long-winded descriptions, something Twisted Miracles is blessedly free from. Larrieu manages to evoke images of detailed, emotion-filled settings with a few well placed descriptors. I can't put my finger on why I loved it so much, but my favorite was Cass's off-handed mention of a St. Christopher's medal swinging from a rearview mirror. It's a great example of Larrieu's smart and elegant writing style, with no wasted words or actions. So, I guess the secret's out. I thought AJ's debut full length novel was great and I can't wait to see what she'll write next! * a grand total of a week.